This site contains Java bindings for OpenCL, the Open Computing Language. OpenCL allows writing programs for heterogeneous platforms that utilize CPUs or GPUs. More information about OpenCL may be found at the Khronos OpenCL website. This library offers Java-Bindings for OpenCL that are very similar to the original OpenCL API. The functions are provided as static methods, and semantics and signatures of these methods have been kept consistent with the original library functions, except for the language-specific limitations of Java. The OpenCL API may be very verbose at some points, and this is not hidden or simplified, but simply offered by JOCL as-it-is. The goal of this library is to provide an object-oriented abstraction of OpenCL for Java. This simplifies the usage and may be found more natural and convenient for most Java Programmers. The library also offers a low-level interface, which is generated using the GlueGen library. This interface is similar to the OpenCL API, but not really intended to be used by clients, and mainly serves as the basis for the object-oriented wrapper. This library also offers an object-oriented abstraction of OpenCL for Java. It has a low-level interface which is based on JNA and generated using the JNAerator library. The low-level interface serves as the basis for the object-oriented wrapper but is not intended to be used by clients. Note that JavaCL is part of the NativeLibs4Java project, which also contains ScalaCL, a library for accessing OpenCL with Scala. The Lightweight Java Game Library (LWJGL) has been extended to also support OpenCL. The original OpenCL API is mapped to a similar Java API, and extended with convenience methods. As an alternative for Java developers who want to benefit from the computing power of their GPU without having to learn OpenCL, there is a library called Aparapi: It allows a seamless integration of GPU workloads into Java Code. The Java bytecode will be converted into OpenCL code and executed on the GPU, transparently for the user. Even if there is no OpenCL implementation, the same code will still run on the CPU in a Java Thread Pool, taking advantage of multiple CPU cores. Further information is available in the Downloads section. Early versions of JOCL-based Java bindings for different OpenCL BLAS libraries are now available in the GitHub repository. Bindings for clBLAS can be found at https://github.com/gpu/JOCLBLAS. Bindings for CLBlast can be found at https://github.com/gpu/JOCLBlast. Further bindings (e.g. for clSPARSE) will likely be added soon. The release candidate of JOCL with support for OpenCL 2.0 is available in the downloads section. Currently, it is supplied with Windows 64bit binaries. When the binaries for the other operating systems are available, the new version will be added to the central Maven repository. Piotr Tarsa has ported some of the JOCL samples to Scala. They can be found on the Samples page. This version should be considered as a release candidate. JOCL has undergone an internal refactoring to allow different versions for the underlying OpenCL implementation Additionally, the binaries for Linux 64bit are still missing. Once they are available, the final version will be uploaded and made available in the Maven repository. The JOCL Cloth simulation demo has been updated. A bug in the simple renderer library has been fixed, which caused a rendering failure with newer NVIDIA drivers. Additionally, a new method for subdividing the edge set for the Java based simulation method has been implemented. 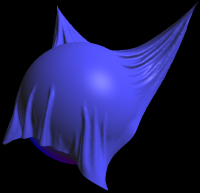 The JOCL Cloth simulation demo has been updated. It now allows selecting the OpenCL platform and device for the execution. Additionally, it uses some utility classes for JOCL that are currently developed. Once the API of these classes is more stable, they will be available as a separate library. The native libraries now contain a version number in their name, and the behavior of the native library loading utility class has changed. See the change log for details. Most of the samples have been updated to use an initialization scheme that better supports multiple OpenCL platforms. Additionally, the OpenGL-related samples have been updated to properly work with the newest OpenGL versions, which require a vertex array object to be created whenever a vertex buffer object is used. The latest version of JOCL contains only a bugfix for MacOS: The MacOS library could not be loaded from the JAR file due to a wrong assumption about the library extension. Thanks to Kashif Rasul for providing the 64 bit Linux and MacOS binaries. The downloads section contains an updated archive with JOCL version 0.1.5, including an important fix of a memory leak for clEnqueue* operations. The archive currently contains the Windows 32 and 64 bit binaries. Other binaries will follow soon. The binary distribution archive which is available in the downloads section now also contains Linux 32bit libraries. The mechanism for loading the native library has been extended so that it may load the library directly from the JAR. The current version contains the native libraries for 32 and 64 bit Windows, 64 bit Linux and 64 bit MacOS. Additional native libraries may be placed in the java.library.path and will then be loaded from the local file system.